The Jewish Holidays have ended, but not without being repeatedly asked - where do you attend services (or...where do you pray)? I go to the 'Green Synagogue', located Monday, Wednesday, Friday and Saturday (Sabbath) at Union Square aka The Greenmarket. It is there that I find refuge from the pressures of work, decompress from the high-speed NYC pace, connect to the seasons that are imperceptible in our urban metropolis, reflect on the miraculous nature of agriculture, experience romance with inanimate (but tasty) objects and discover a sense of peace. It is quite a spiritual experience. Most weekends, I am able to spend a day at Katchkie Farm, where walking the fields, picking vegetables to bring home, lying in the grass, visiting the pigs, collecting eggs, catching up with Farmer Bob produces that same sense of connectedness and awe. There is something enormously powerful about being connected to the land, to participating in growing food. In working cooperatively with Mother Nature (or in spite of her antics like drought, blight and giant hailstones), there constantly are life-affirming moments. It is the essence of being completely human, treasuring the sun, rain, shade, seasons, bugs, breeze, flavors and smells. It is a communal activity with opportunity for solitary time as well. And as a recent newcomer to the soil, I do not doubt that I am romanticizing the hard life of a farmer and his/her family. But for me, it is a gift that continues to unfold and inspire every day. For some agriculture offers another avenue to experience, connect and communicate with God in a tangible and traditional relationship. My visit this past week to Eden Village Camp, in Putnam County, was window into this age-old bond within a modern culture and timeless human occupation of working the land. It is the first Jewish overnight environmental camp for children, merging the movements to reintroduce nature into their technological fast-lane lives, discover and express concern for the environment, learn where food (especially healthy food) comes from - all while in a value rich program that celebrates Jewish traditions. Partnered with the camp on the farm segment, is the first Jewish Farm School. The camp had ended for the summer and was host to educational programming - the morning subject was Permaculture - "Permaculture is sustainable land use design. This is based on ecological and biological principles....(it) aims to create stable, productive systems that provide for human needs, harmoniously integrating the land with its inhabitants" (Wikipedia). The morning discussion group, which followed on the heels of a spirited and dynamic morning group prayer and a meal by a smoldering campfire, drew on ancient biblical texts to inform behavior and agricultural standards for current farm practices. The facilitator introduced "big picture philosophy integrated with detailed day to day guidelines". Several pages of Agricultural Laws of the Torah were distributed and a passionate conversation on topics including limitations on consumption; sharing with the poor; and the ephemeral nature of ownership of land ensued. On the handout: Laws Concerning Harvest - "Not to reap the entire field, leave the unreaped corner for the poor... leave the gleanings for the poor " (Lev 19:9). Within minutes the conversation was about limited resources, specifically water, referencing its scarcity and the audacity of our culture to bathe in drinking water and fills its toilet with water that exceeds the purity standards of many third world countries. The intensity of the discussion rivaled any global political conversation that would have been a topic at last week's Clinton Global Initiative. On a lighter, yet significant note, anecdotes from the summer camp program were shared. Tales of the snack gardens outside each bunk, where campers could grab a fix of immediately edible treats - like herbs and cherry tomatoes. Or the bike you could ride that would power the blender. How about the Olympic game of synchronized grazing? Naturally, there was no Color War (think Color Peace). The garden was a learning experience on several levels. Divided into the 12 months of the year (based on the Jewish calendar) campers tied cyclical events to plantings. The bed for the month of Av, which commemorates the destruction of the Temple and exile, was planted with thorny rose bushes - with despair there is hope; Adar, which includes the festive holiday of Purim, had wildflowers for wild celebration. For programs in the garden, a podium (of sorts) was surrounded by beds of sage...to enhance wise discussion. 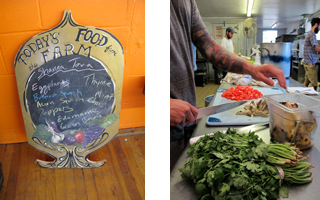 And of course, campers harvested, cooked and shared meals with gusto; the 25 yard-menu. Bread was baked from camp-grown stalks of wheat, herbal teas brewed, and the one goat yielded milk for ice cream (just about enough for all). Yes, they also ate squash, chard, eggplant, pesto and other dishes my sleep away camp never served. It was a brief but exhilarating visit, which culminated in my favorite place (well, second to a field of tomatoes) - the camp kitchen. The prep crew sang while they worked, and no doubt, whoever enjoyed the fruits of their labor could taste the love. As I listened to the morning discussion group as well as the overview from the camp and school directors, I struggled to place these dedicated individuals in a social context I could understand because they seem like such an anomaly. The timeline was somewhere between a 60's commune in Colorado, a Kibbutz circa 1948, a Shtetl like mythical Anatevka of the 1600's or biblical Galilean herdsmen. 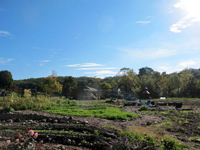 For years I have been asked - how does a third generation New York City girl end up owning an organic farm? Now I know, heirloom seeds. Ancient roots.